FAI is a condition in which the ball on the hip bone (that allows your hip joint to move) can’t move fully within the socket. This is caused by too much bone around the ball (or femoral head) or because the socket is turned backwards (retroversion) causing the femur to bump into the rim of the socket. In about 80 percent of cases, FAI may be caused by both too much bone and retroversion. When the ball on the hip bone hits the rim of the socket, the cartilage and labrum can be damaged. These tissues are the cushion between the ball and socket (clear space on X-rays). When these tissues are damaged, you may feel pain, and the tissues start to degenerate (get small tears). These tears form arthritis. If left untreated, you will continue to feel pain and arthritis, and you might eventually need a hip replacement (total hip arthroplasty). the joint will catch or pop. 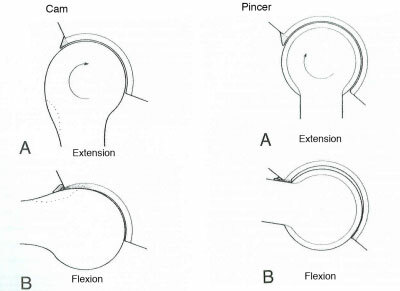 On the right, when the socket is too deep or it is facing backwards, the head gets pinched and the labrum often gets damaged and a ridge or divot can form on the neck (seen on the right in diagram B). Retroversion is a form of acetabular dysplasia (hip socket too shallow) where the socket is facing more backwards than it normally would. This can cause the femur (thigh bone) to bump into it when you flex your hip. This happens because the front of the socket (anterior wall) is lower than the back of the socket (posterior wall). It can be seen by subtle shadows on X-ray. Anteversion means facing forward and is normal. A specialist may recommend surgery if you have pain that is in the front groin (anterior) that affects daily activities and prevents you from doing the things you want to. If X-rays show extra bone around the head/neck with mild arthritis but possibly good cartilage, you may be a candidate for a femoracetabular debridement. If the hip joint socket is too shallow (retroversion of the acetabulum) and this seems to be part of the impingement, you may need a periacetabular osteotomy. A periacetabular osteotomy cuts away extra bone in the socket. It can happen with or without a femoral head debridement. What is a femoroacetabular debridement? Femoroacetabular debridement is a surgery through an incision over the side of your hip where the surgeon removes the bone and damaged tissue. What is a periacetabular osteotomy (PAO)? A periacetabular osteotomy is a surgery on the hip socket to remove extra bone and damaged tissue. The surgeon goes through an incision over the front of the hip, then, with X-ray guidance (fluoroscopy), carefully cuts through the three pelvic bones (ischium, pubis, ilium) around the hip socket (acetabulum) to free it from its original position. Once the acetabulum is in its new location (facing the right direction with good coverage), we fix it there with screws (usually three to six). From the same incision, we can access the hip joint to remove (debride) extra bone from the head/neck as well if we need to. You may. We recycle the blood you lose at surgery and give it back to you if there is enough. But sometimes you will need a transfusion of one to two units after surgery. You may donate your own blood if you are able, but if not, the blood bank is very safe, and we can use that if it's needed. What are the major risks to the surgery? Blood clot - We reduce risk of this by using a blood thinner, TED hose (compressive stockings), and compression boots on your feet to increase circulation. Infection - You are given IV antibiotics before surgery, which is continued for one day after, and then keep a close watch of the incision for redness or drainage. Failure to heal - This is uncommon but always a concern, especially if you smoke. If the bone doesn't heal, the screws can break and the bone can move. An additional surgery to increase bone healing could be needed, but very rarely. Avascular necrosis - This is uncommon, but possible. If the blood supply to the femoral head is damaged, the bone may collapse and die. This could speed up the need for a total hip replacement, if it were to happen. Nerve palsy from PAO - A sensory nerve called the lateral femoral cutaneous nerve is right where we do surgery. We do our best to identify it and protect it but there is a 50 percent chance you will have some numbness over the front of your thigh; over time sensation usually returns. Usually, the hospital stay is two to three days after surgery. Then, starting the day after surgery, you will have physical therapy twice a day that includes gentle exercises and learning to sit, stand, and walk with partial weight-bearing and crutches. For debridement or periacetabular osteotomy, you will be walking within a couple days of surgery, on one to two crutches for three months. It usually takes nine to 12 months to feel fully recovered. After you leave the hospital, you must walk, rest, and let your surgery heal. First six weeks: You will finish taking blood thinners (aspirin for six weeks), wear TED hose, walk with two crutches (partial weight bearing), and keep the wound clean. After three to four weeks you should be able to drive. Next six weeks: You will transition to one cane or crutch as instructed by your physician until three months after surgery; you may start gentle stretching or strengthening exercises; walk. After three months: You may return to work part time or full time as possible (two to three months from surgery), continue to walk and return to gentle exercise. After six months: You may return to full activity (when the bones are completely healed) except for running/jumping activities. The best lifelong activities are walking, swimming and biking to preserve your hips’ health. You will take narcotics only as long as you need to, about seven to 21 days from surgery. Be aware that sometimes anti-inflammatories (NSAIDS) can slow down bone healing, but Tylenol doesn't. You will probably also have staples and should see your doctor in two weeks, then again six weeks after surgery for X-rays, then three months, six months, one year, and every year or two so we can see how your hip progresses. How long will the surgery last? Will I need another surgery? We hope to prolong the time between now and when you need a hip replacement. But the exact time in years is unknown, and on an individual basis, based on the amount of arthritis in your hip already. We advise patients to resume activities that you can tolerate, especially walking, swimming and bicycle riding. We discourage repetitive jumping, running, and heavy manual labor and lifting. These activities tend to wear out the hip faster. Who do I call if I'm having problems after surgery? Call the nurse/MA who works with your surgeon. Call the orthopedic clinic and ask for her voicemail; she will get back to you within a business day; otherwise, call the orthopedic resident on-call.